The Midhope flock of Suffolk sheep was formed in 1982 with ewes derived from T Tomlinsons Lightash flock.The aim then and now is to produce ram lambs and shearling rams which when used in commercial flocks produce lambs which are easy fleshing and of good confirmation. 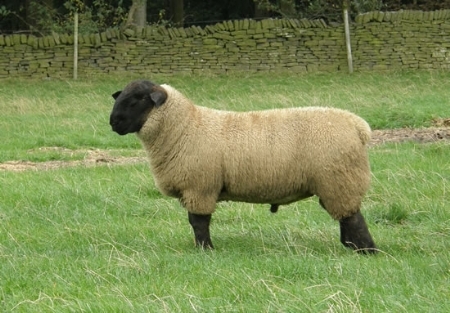 The shearlings and ram lambs are sold privately or at Bakewell,Skipton and various other livestock markets. The use of signet recording and ( Since joining the Suffolk Sire Reference Scheme, now PSB ) AI has meant that we have been able to use sires to both improve the EBV's for growth rate and carcass quality and at the same time improving confirmation and breed character. These sires were chosen for their length,superb confirmation and growth rate. Below is a selection of shearlings rams, the progeny of the above sires.